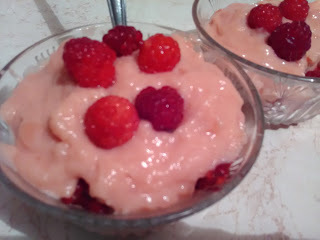 Dessert in cup with raspberries, light, fast and delicious summer refreshment. Brew the pudding, 300 ml milk, put it in a small tin. Into a small bowl, mix the pudding with the sugar, add 100 ml of cold milk. Mix thoroughly with the ingredients that it does not have a clod. Pour into boiling milk. Store fillets until they are thickened, and still put in the coup or serving bowl. You need hot water to wash. 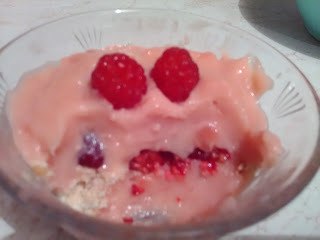 Put it from filling in the bowl, so, melted biscuits, raspberry and cover with fill. Decorate it pudding from fresh raspberries. 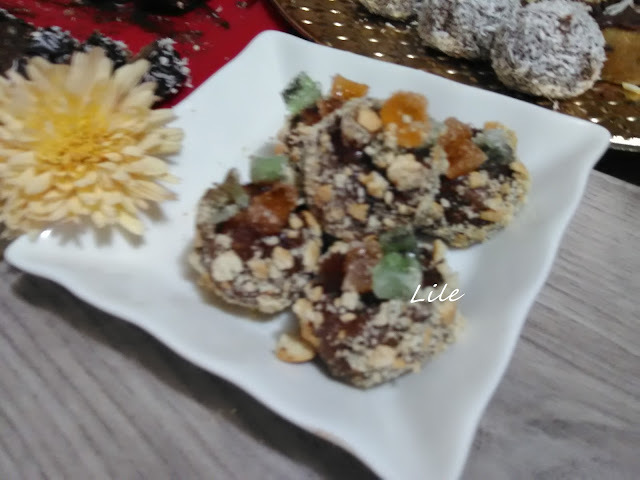 Tasty dessert, with a little carob and quick to make. Dessert for touching two person. DESERT OD CASA OD MALINI. Desert od casa so malini,lesno,brzo i vkusno letno zasladuvanje. Se vari puding,od 300ml mleko,se stava da zovrie.Vo pomal sad se mesa puding so secer se dodava secer i 100ml ladno mleko.Ubavo se mesat sostojki da nema grutki.Se sipuva vo vo vrelo mleko.Se vari fil,dodeka se zgusne,i uste topol fil se stava vo casi ili zdeli za serviranje.Zdeli treba so topla voda da gi navlaznite. Se stava fil,meleni biskviti malini i pak se pokriva se so fil. Odozgora vrz puding se ukrasuva so svezi malini. Vkusno,so malku kaloroji i brzo.Desert za posluzivanje na dve lica.